Posted on Mon, Jan 16, 2012 : 12:21 p.m. The memorable run continues for the Michigan football program. Only, this time, it's among the NFL ranks. Several players and coaches with ties to the Wolverines dot the rosters of the four teams that have made their respective conference championship games (49ers, Giants, Patriots, Ravens). Jim Harbaugh, head coach of the 49ers. He attended Pioneer High School (although did not graduate from there) and went on to star at Michigan, where he became one of the most accomplished quarterbacks in school history. He finished third in the Heisman Trophy voting his senior season and was a first-round draft pick of the Chicago Bears. He was widely rumored to be a target of Michigan's most recent head coaching search, which eventually culminated with the hiring of Brady Hoke. Harbaugh's father, Jack, is a former Michigan assistant who once hired Hoke while head coach at Western Michigan. 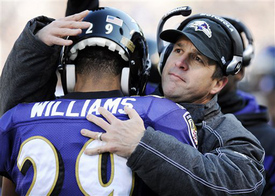 John Harbaugh has at least one playoff victory in each of his four seasons with the Baltimore Ravens. John Harbaugh, Jim's brother, another former Pioneer High School student and now in his fourth season as head coach of the Ravens. He's compiled a 44-20 regular-season record in Baltimore and earlier this year led Baltimore to a 16-6 victory against Jim Harbaugh and the 49ers. Tom Brady, quarterback of the Patriots. He started at quarterback for Michigan in the 1998 and '99 seasons, although his legacy also is tied to his intense job battle with Drew Henson, with whom he shared snaps even after becoming the starter. Brady went on to become a team captain as a senior, and Michigan went 20-5 in games started by him. He was a sixth-round pick of the Patriots in 2000, but has exploded into a star in Foxboro. He is a seven-time Pro Bowl selection, three-time Super Bowl champ, two-time Super Bowl MVP and two-time league MVP. Jim Herrmann, linebackers coach for the Giants. He is a former Michigan linebackers coach and defensive coordinator, including for the 1997 national championship team. Mario Manningham, Giants receiver who was a second-team All-American at Michigan before leaving after his junior season. He has seven catches for 99 yards and two touchdowns in the playoffs. David Baas, Giants center who was Michigan's only Rimington Award winner (given to the nation's best center) until David Molk matched the feat this past season. Zoltan Mesko, Patriots punter who was a second-team All-American at Michigan and a two-time first-team All-Big Ten selection. His 41.5 net yards per punt this year was third in the NFL. Andy Moeller, Ravens offensive line coach who graduated from Pioneer High School and coached at Michigan from 2000-07. From 2004-07, Michigan had 11-of-25 first-team All-Big Ten selections. Was Baas' position coach at Michigan. Cam Cameron, Ravens offensive coordinator who was a graduate assistant, receivers coach and quarterbacks coach at Michigan from 1984-93. He was Jim Harbaugh's position coach with the Wolverines. Jonathan Goodwin, starting 49ers center who played at Michigan. He was a fifth-round draft pick of the New York Jets in 2002. Mon, Jan 16, 2012 : 7:08 p.m. COACHES!!! COACHES!! COACHES!!! This is what MEEEEEANchigan produces!! Day 3- Quetion 3- What former or current MEEEEEEEEEEANchigan COACH, brings glazed donuts to every MEEEEEEEEANchigan game? Hint: It is not BIG AL!! The answer to Day 2: It is a tie between Borges and Mattison!!!! Mon, Jan 16, 2012 : 6:47 p.m.
Manningham looked great against Green Bay, Sunday. Woodson, not so great. Mon, Jan 16, 2012 : 6:27 p.m.
Dude...you forgot Greg Mattison...who was defensive coordinator for the Ravens before heading to AA! Mon, Jan 16, 2012 : 8:03 p.m.
Dude....the article Kyle wrote is about coaches/players who are 'in the playoff's this weekend' !